"In a heightened and memorable language Patricia Traxler's work performs the ecstasies and terrors of a life experience deeply lived and vigilantly observed. Her skills and her wit are richly exhibited. During my re-readings of her collection, a Robert Frost phrase came to mind: she has 'a lover's quarrel with the world.' There is in Naming the Fires a brave performance of the confusions and joys on a long road to self-possession." --Steven Hind, Judge, the 2019 Hefner Heitz Kansas Book Award in Poetry. Available at Amazon.com and Barnes & Noble (bn.com). "From talented newcomer Patricia Traxler comes a brilliantly written literary suspense novel about how desire can become jealousy, obsession, and finally murderous rage. 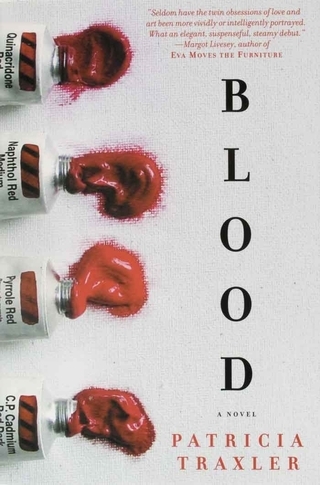 Blood is equal parts auspicious literary debut and page-turner about four people whose lives become irrevocably intertwined during one year at Radcliffe College. Blood captures the reader with its opening line, 'Though it’s true there’s a killing in my story, its principal violence is, I think I’d have to say, the violence of love.'" Blood was also published in the UK, and in Spanish, Swedish, and German translations. To see reviews, click Blood link above or in sidebar at right; Blood is now available on Kindle, Nook, Apple iBooks, Google eBooks, and Borders eBooks. Traxler's second volume of poetry explores the varied and sometimes risky terrain of love, desire, trust and broken trust, the power of secrets and silence, and the influence of family, in particular her Irish-American heritage. In contrast with her first book, Blood Calendar (William Morrow), which reflects her native California roots, The Glass Woman uses the imagery of an unfamiliar prairie landscape to address solitude, alienation, and acceptance. For more details about The Glass Woman, click link above or in sidebar at right. "This volume of poems introduces a major new voice in contemporary poetry. The sources and subjects range over music, motherhood, war, sexual experience, aging, marriage, and death. They are women's poems, men's poems...poems about living, dying, loving, and leaving. They present an original and strong new talent that is, for all its savagery, buoyant."